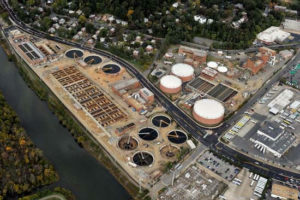 The Arlington County Board today approved a Solids Master Plan for the Water Pollution Control Plant’s (WPCP), culminating a two-year public process to determine upgrades for handling the plant’s biosolids. These solids are separated from wastewater in the treatment process before the highly-cleaned wastewater is released into Four Mile Run, a short distance from the Potomac River. The Board voted unanimously to adopt the plan. The Board also provided guidance to the Manager to present an evaluation of alternatives, including an update on regional options with DC Water, to the Board and civic associations surrounding the pollution control plant before finalizing the facility plan, (two to three years from now), and awarding a construction contract. To read the staff report, visit the County website. Scroll to Item No. 59 on the agenda for the Tuesday, July 17, 2018 Recessed County Board Meeting. The plant’s current solids handling equipment is near the end of its useful life. The Master Plan will modernize the plant’s solids treatment capabilities over the next decade. The old system and equipment will be replaced with equipment to perform thermal hydrolysis and anaerobic digestion, the recommended processes to eliminate pathogens and reduce the odor of biosolids. Arlington County Water Pollution Control Plant. Once the new process comes online in 2027, the gas can be used on-site to generate electricity or used off-site to fuel vehicles like our Arlington Rapid Transit bus fleet. This will be the second phase of recent Water Pollution Control Plant systems upgrades. The County completed the liquids treatment process upgrades, as guided by the 2001 Master Plan, in 2011. These upgrades protect existing high-quality waters and have eliminated external bypasses (partially treated water that is discharged into County waters), with an overarching goal of supporting the Chesapeake Bay Preservation Ordinance, a statewide program to help restore the bay to health, first adopted by the County in 1992. The County Board approved funds for the design and construction of the facilities recommended in the Master Plan in the Fiscal Year 2017-26 Capital Improvement Plan (CIP). Those numbers were adjusted downward in the proposed FY 2019-28 CIP, due to revised cost estimates. The budget for the overall upgrades is broken into three spending phases: Phase 1: $10 million; Phase 2: $5 million;Phase 3: $139.75 million. Learn more about the Solids Master Plan. Learn more about wastewater treatment in Arlington in this video.